At chef Connie Tran’s new pop-up, taste home-style Vietnamese and learn a little about why Little Saigon continues to thrive. BÊP Vietnamese Kitchen is a new brunch-only, pop-up project from chef Connie Tran that begins this Sunday, April 21. Born in the seaside summer town of Nha Trang in southern Vietnam, Tran immigrated to the U.S. when she was just six, after the fall of Saigon in 1975. She’s been in Southern California since the age of eight. After college, she helped her mother open a restaurant, earned a masters degree in East Asian Literature (her thesis was entitled “Restaurants as expressions of ethnic communities in the larger, American landscape”) and worked closely under her mentor, chef Zov Karamardian. BÊP is Tran’s first solo project. Held in the sunlit atrium of Franco on Melrose, the brunch service honors Tran’s passion for Vietnamese dishes that are seldomly found served family-style, or, as they would be served in a home. While pho restaurants remain popular in L.A., and bánh mì is slowly entering mainstream consciousness, Tran noticed that not many Americans knew much about Vietnamese home-cooking, especially that which is eaten during the day, at leisurely meals with friends and family. 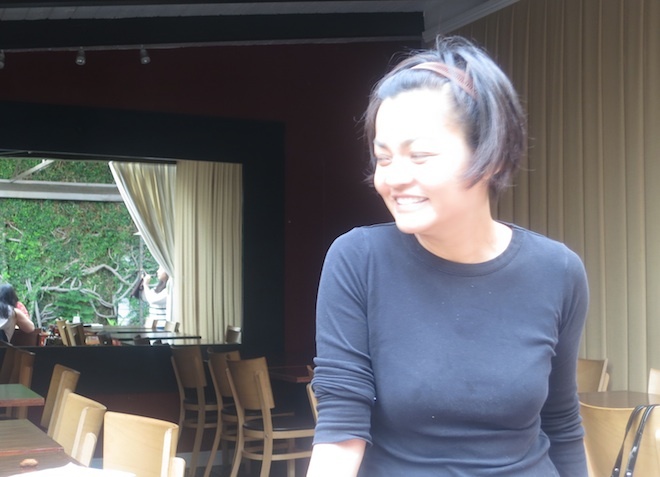 Recently, we spoke with Tran about her experiences and the road that led to BÊP. It’s in the South, but my family, our ancestors, immigrated from the North. It’s a quaint town, and even now, it’s known as sort of a seaside resort town. Back in the day, it was where people went on summer vacation. It’s right outside of Saigon. We moved to Saigon a few years after I was born, and then lived in Saigon until the fall of Saigon in 1975. My father was in the Southern Vietnamese army, so my mother decided to take advantage of this refugee program that was part of American policy back then. Basically, families in the U.S. would volunteer to adopt families from Vietnam. My father was eventually taken as a prisoner of war because of his rank, but my mother—who worked as a translator for the Secret Service—gathered the entire extended family and found us a compound to live in Huntsville, Ala. Two families, who lived next door to each other, adopted nine of us at once. It was insanely lucky and so very generous of them. It reinforced our sense of family. We stuck together. Even now, our whole family lives on one street in Garden Grove. How did you get to California? After being in Alabama for two years, my mother realized that though our hosts were extremely generous and took us to church—we were Catholic—and cared for us as if we were their own, we needed to feel like we belonged somewhere. She knew from friends that L.A. had a huge Vietnamese enclave, so one day she packed us all into a Volkswagen bus and drove West. Did your mother always want to get into the restaurant business? Not really, not initially. It became a necessity for my mom to have a job where she worked for herself because of a family tragedy—my brother was hit by a drunk driver—so she needed to be at home, or close to home. She’d never owned a business before, but she worked with her parents—my grandparents—who owned and operated many restaurants in Vietnam. I read about Cafe D’Orient, which was reviewed in the L.A Times in 1995. How did that come about? Oh my goodness! What did you say? So that was it. We opened a restaurant. I was 23, and I was the chef. I read that Cafe D’Orient served not only Vietnamese food, but also Chinese, Thai, Cambodian, Japanese and other Asian cuisines. How did you know how to cook all of that? My uncle had a restaurant here at the time, a seafood place. I loved hanging out there, and sometimes I’d help out in the kitchen. They had these huge, yard-in-diameter-sized woks that are still just fascinating to me. My mother and I created a menu on paper, and I took it to my uncle and said, “I need to learn how to make these things.” So he called up a dozen restaurant owners that he knew, and wrote down, next to each menu item, the name of the restaurant where I should go to learn how to make each dish. It was incredible to just get to walk into all of these restaurants around L.A. and cook with the chef. Usually, Asian chefs never share their recipes, they are very secretive. But because of my uncle, they were all very supportive. I wrote my thesis during the day and then went to cook at night. It was really incredibly fun… to have half my brain in academia and half in this real, fast-paced, hands-on work. Through friends, I met Zov Karamardian, who’s really a force in Southern California’s food scene. She’s iconic in OC, and sits on the board at the James Beard Foundation, which a lot of people don’t know. I worked at Zov’s for a really long time. She became my mentor. She was instrumental in showing me how to operate a business that doesn’t have to be just one brick and mortar location. She taught me the business side of restaurants, and how to make hospitality a business, especially in terms of service… She started off as a caterer, and so knew how to make really good food in a very efficient way. She also taught me to be as honest to the cuisine as possible. I learned enough from her that even after dabbling in other businesses, I felt confident in what I had learned to start BÊP. How does your mother feel about BÊP? Oh, she loves it. She keeps saying, “You should have done this 20 years ago!” It’s something she’s always wanted me to do because she feels that the nuances of Vietnamese food and the regional differences and the way we prepare it and the formality and traditions of it… it’s so different from what people in the U.S. know, but it’s still accessible, still approachable. What’s your goal with BÊP? I was born in Vietnam, but I grew up here, in Vietnamese-American society. So my philosophy is to respect what I know from here. I am not seeking to recreate modern Vietnamese cuisine, or replicate what’s currently on menus in restaurants in Vietnam. My cooking is focused on honoring the community of Little Saigon. What is it about the menu that you are especially proud of? Everything you’re tasting is me, and is a little bit of me, BÊP is my homage to my mom, to Zov, and to my community. How long BÊP will go on? Indefinitely. Eventually, I would like to find a permanent spot, a brick and mortar, to open for breakfast and lunch daily. Ideally, I would like to open a cafe/market after that. We’re also getting ready to do a BÊP night market, which will be fun. Nighttime food is so different from daytime food, and I want people here to experience that. We’ll do one night called BÊP at night where I’ll serve what’s called lai rai, which means something like “kicking it” or “drinking food” — it’s family-oriented food that’s meant for socializing over. The name is very colloquial Vietnamese, the boys say to the ladies, “Hey, you wanna lai rai tonight?” And they you go hang out for hours, over grilled octopus or fermented beans and drink the night away. There’s some crazy stuff served sometimes, stuff like duck blood pudding. I don’t know if people can handle it, but I’m doing it anyways. It’ll be fun. Essentials: BÊP Vietnamese Kitchen pops-up at Franco on Melrose every other Sunday beginning Sunday, April 21. A single seating is available at 11:30 a.m. Reservations can be made by emailing info@bepkitchen.com. The eight-course prix fixe menu is $37 per person and includes a selection of house-made non-alcoholic beverages. BYOB.